Be it a thriller or children book, wellness advice or environmental concerns, there’s a book for every reader and a book to be written for every writer. An Unlikely Story is lucky to be in an area with so many unique, talented voices writing so many different kinds of books. 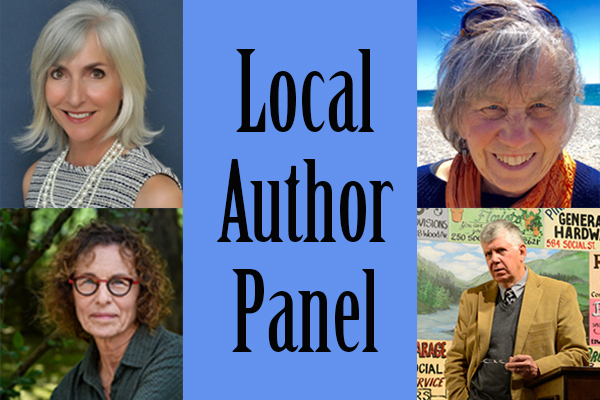 Join us for an event with local authors Noel Foy, Irene Buchine, Pat Hinkley, and Julien Ayotte, and celebrate some of the talented people living just down the street! Noel Foy is the writer of ABC WORRY FREE. Her mission is to empower teachers, parents, counselors, coaches and students with quick, user-friendly ways to use neuroeducation findings to their advantage. Having these tools can decrease stress and boost learning, engagement, Executive Function and performance in and beyond the classroom. In response to the rise in anxiety, Noel’s, solution-focused story called ABC WORRY FREE, which was released in the fall of 2018, provides readers of all ages with a transferable strategy to face and manage anxiety. Drawing on personal experience, Irene Buchine tells the story of two children trapped in the darkness of depression, and what it takes for them to find their way out. Ms. Buchine approaches the complicated issue of depression in children with great respect and sensitivity. She provides the reader a window into the difficulties children and families face when dealing with the challenges of depression and mental health. CELIA AND THE LITTLE BOY is a story of hope designed for children and adults alike. Irene Buchine is a member of SCBWI and CELIA AND THE LITTLE BOY received the 2018 Certificate of Excellence and the Royal Dragon Fly Book Award in Psychology, from the children’s literary resource magazine, Story Monsters Ink. Pat Hinkley is an author, instructor, holistic life and "Climate Concerns Counselor" dedicated to helping others discover their unique best in any life situation. Pat’s medical experience as an RN and holistic psychotherapist informs her unique perspective and ability to help people better manage their responses to the stressors and situations in their lives, bringing the seemingly out of control back into balance. Pat wrote CLIMATE SENSE about the conundrum of the climate changing before our eyes and how it can be overwhelming. CLIMATE SENSE invites readers to feel the enormity of the current climate situation and then look at the empowering actions they can take to free themselves of that inertia. CLIMATE SENSE is a practical guide to showing the way.